What is N’s Court 139 Lego? N’s Court 139 Lego is a hotel-like monthly residence produced for executives.With our attention focused on quality and design in each dwelling unit which are complete with functional furniture and electric appliances, an open living space welcome you.You can specify the period of stay you need from short stay of less than one month to long stay for trip, business trip etc. N’s Court 139 Lego is located in Fuchu city. There are huge department stores and many stores in front of Fuchu station. Also, there are many huge parks surrounded by beautiful nature such as ‘Kyodonomori’, ‘Fuchunomori koen’, and ‘Asamayama koen’. Fuchu city is the convenient city to live coexists with nature and city. Have a good life at N’s Court 139 Lego that ensures higher level of comfort. N’s Court 139 Lego has automatically lockable door, reception, small convenience shop, delivery box, elevator, sauna, theater lounge, cafe lounge, and exercise area. They provide the rental service for bicycles, PC, mechanical massagers, beddings and consumer electronics. Also, they provide many convenient services such as receiving packages service, dry cleaning pick us and drop off service, making copy and sending FAX service. Outside of N’s Court 139 Lego is full of flowers and natures. Inside of N’s Court 139 Lego is full of BGM and artworks. Shall we stay at N’s Court 139 Lego coexists with the newest facilities and the warmth of people and nature? “You feel like you live in a hotel”, said one of our residents in the interview of a housing magazine. N’s Court is not just for “a living” but caring services of the staff at the front desk or inside the buildings offer you “hotel-like life”. This is an information desk handling any kind of information and requests.Opening hours: 7a.m. – 9p.m. We have just about anything useful in daily life such as newspapers and magazines.Opening hours: 7a.m. – 9p.m. Cleaner picks up your laundry and delivers them to the front desk. The front desk takes care of clearing the payment. 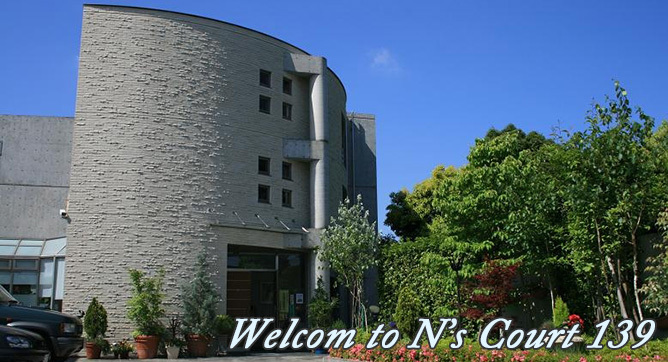 If you are visiting Tokyo or planning to live here, I highly recommend staying at N’s Court in Fuchu City. As a professional working in Japan, it is difficult to find housing that would accept foreigners. But the friendly staff at N’s Court treats me like a member of their family. Besides the welcoming staff, the services and amenities offered here are wonderful. In the lobby, they provide dry cleaning pick up and drop off service, electric-car rental, bicycle rental, a small convenience shop, exercise area with gym equipment, sauna, laundry room and a whole lot more of amazing Japanese hospitality. I can ramble on and on about it.